LOS ANGELES (AP) The Dodgers were baseball’s best team during the regular season, piling up 104 wins, blasting 53 homers in June and finishing up a 43-7 run in August. 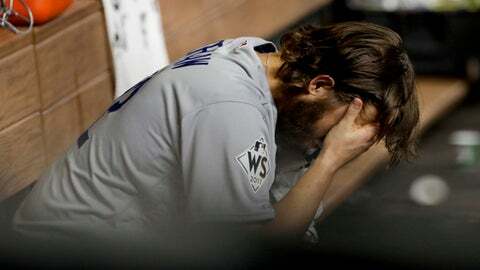 Now, they’re one loss away from being eliminated in their first World Series appearance since 1988. Riding high in summer, potentially knocked out in fall. All that early success could be wiped out with four defeats in October, leaving the Dodgers without the title they so desperately crave and last won 29 years ago. Los Angeles trails the Astros 3-2 heading into Game 6 on Tuesday night at Dodger Stadium. ”Right now, we’re not thinking of the alternative,” Roberts said. The Dodgers won their record fifth consecutive NL West title before rolling past Arizona in the NL Division Series and the defending World Series champion Cubs in the NL Championship Series. But that’s nothing to hang their hat on. ”At the end of the year, if all you’ve won is the NL West and you still didn’t reach the World Series or win the World Series, you didn’t reach your goal,” outfielder Andre Ethier, the longest-tenured Dodgers player, said on the eve of Game 1. Winning 100-plus games doesn’t guarantee anything, either. Heading into opening day this season, 16 teams had posted that many wins since the 21st century began. Just two went on to win the World Series: the Cubs last year and the Yankees in 2009. As for the others, they’re better remembered for losing than winning. The Mariners tied a major league record by winning 116 games in 2001. But Ichiro Suzuki and his teammates didn’t get past the ALCS, bowing in five games to the Yankees. The great Orioles teams of the late 1960s and early `70s had dominant pitching to go with an offense powered by Frank Robinson, Brooks Robinson and Boog Powell. They won 109 games in 1969 only to lose to the Miracle Mets in the World Series. They followed up with 108 victories in 1970 and beat Cincinnati for the title. But in 1971, despite notching 101 wins and having four 20-game winners on the mound, the O’s failed to defend their title, losing to Pittsburgh in seven games. Bash Brothers Jose Canseco and Mark McGwire powered Oakland to 104 wins in 1988, only to lose to the Dodgers in the World Series. The Athletics rebounded the following year with 99 wins and beat the Giants in the earthquake-interrupted Series before racking up 103 wins in 1990 and getting swept by the Reds in defense of their title. The Dodgers had many milestone moments during the regular season. Alex Wood began the season 10-0, the first Dodgers starter to do so since Don Newcombe in 1955. Cody Bellinger, a favorite for NL Rookie of the Year, hit for the cycle on July 19, the ninth player in franchise history to accomplish the feat. Closer Kenley Jansen was undefeated. By early August, the Dodgers had gone 43-7 for the best 50-game run by a major league team since the 1912 Giants. They coasted for much of the season, with their lead stretching to a whopping 21 games on Aug. 23. It was enough for them to survive a woeful September stretch in which they dropped 16 of 17, including a major league-worst 11 in a row. But the turning of the calendar has brought mixed results. Jansen has a blown save and a loss in this World Series. Ace Clayton Kershaw, so outstanding in a Game 1 victory, couldn’t hold a four-run lead in Game 5 and allowed the Astros to tie the score on a walk, two hits and a three-run homer. Houston eventually won 13-12 in 10 innings to move within a victory its first championship. This year, with a pair of 100-win teams in the World Series for the first time since 1970, someone is likely to end up being forgettable.